Interlocking hearts shine with the glory of love in earrings by Pichaya. The earrings are expertly crafted by hand with the luminous elegance of sterling silver. 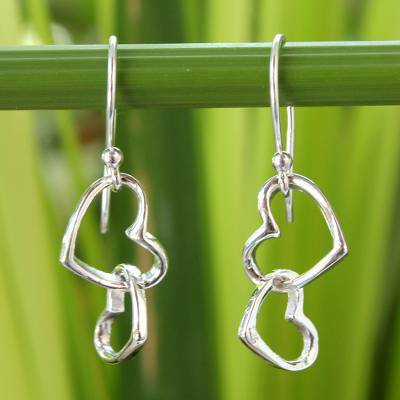 You can find sterling silver heart earrings 'Locked in Love' by Pichaya in jewelry categories such as Heart Shaped Earrings, No Stone Earrings, Silver Earrings, Sterling Silver Earrings and Dangle Earrings. Enjoy exploring these sections for other Novica treasures. I bought these earrings because I wanted some heart shaped earrings. These are now my favorite earrings. The are so comfortable to wear. I react to some earrings, but not these. They are as good for everyday wear as they are for dress up occasions. The one word of caution I would make is that these are made of soft, malleable silver so be careful how you store these and gently reshape if they get really bent out of shape. "Nice earrings for teens and young adult women "
These are well made and attractive earrings. My daughter was pleased with them (Locked in Love). Love them! They are very nice and just the right size.